Reach Mauritius Airport. Pickup from Airport. Transfer and check-in to your Hotel. The rest of the day is free at leisure for you to enjoy the beautiful island surroundings on your own. Enjoy dinner and an overnight stay at the Hotel. Free bies:- Fruit Platter in Room upon arrival. 30mins Massage Free (to be confirm within the first 3 days after arrival between 10 am to 2pm). A wedding certificate not older than 12 months will be required at the check-in. Guaranteed Late Check-out (12:00 – 18:00): 50% of the room rate (Dinner included in Main Restaurant) / Late check-out after 18.00 hrs: 100% of the contracted rate. 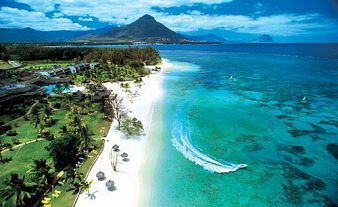 Guaranteed Early Check in / Late Check out rates are excluding offers.Dress Code Advice: Allow us to make your comfort essential for a memorable holiday in Mauritius. We recommend that during the day, guests favour lighter clothes such as dresses, shorts and T-shirts. In the evening, gentlemen will feel more comfortable in long trousers and shirts. Shorts, men’s sleeveless shirts and sandals are not permitted in hotel restaurants during dinner.Safety and hygiene standards in hotels’ rooms : Use of cooking equipment, electric cookers, induction ovens etc is not allowed in the rooms. Should guests have specific meal preferences, do keep us informed to enable us to assist the guests accordingly during their stay at the hotel.